I had no clue what a parsnip was until I ventured into the land of homemade baby food making and started doing a little research. My son LOVED carrots (so much that he started turning orange) and I read that parsnips were very similar to carrots. Basically a parsnip is the ugly cousin to a carrot. 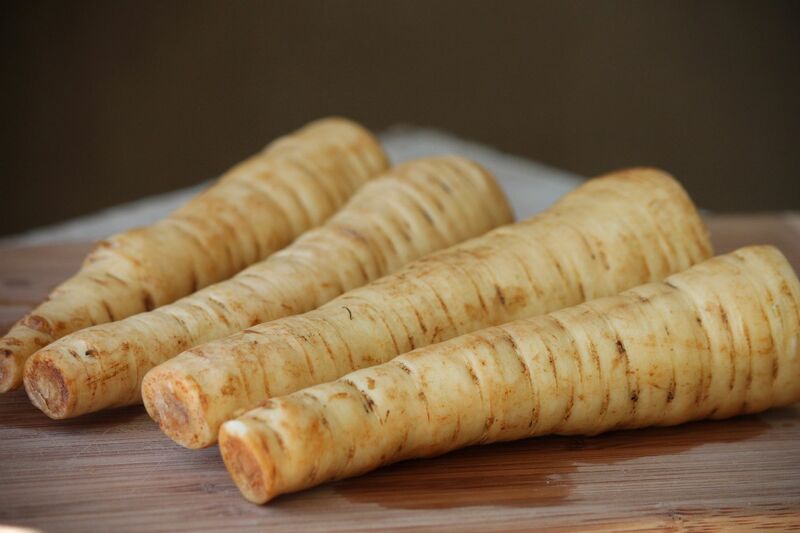 It has a weird root looking exterior and once cooked the parsnip has a sweet buttery and slightly spicy taste. 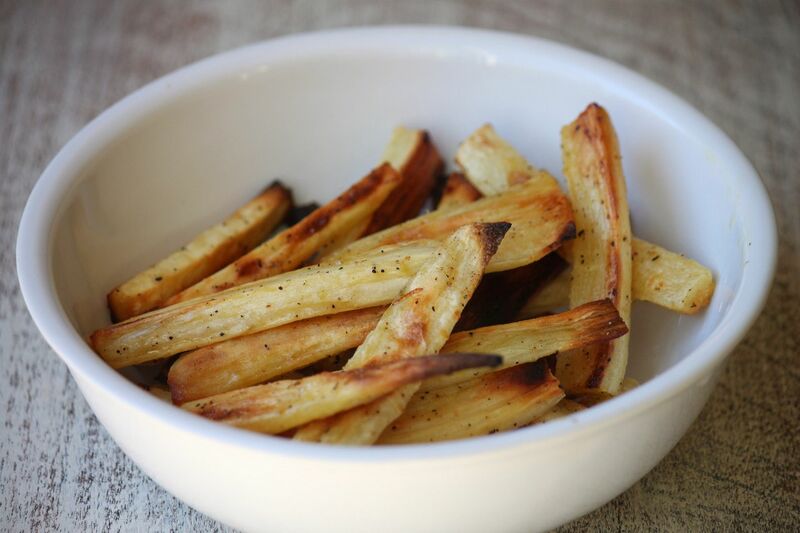 The parsnip is also low in calories and high in fiber, which makes it the perfect substitute for potato french fries! 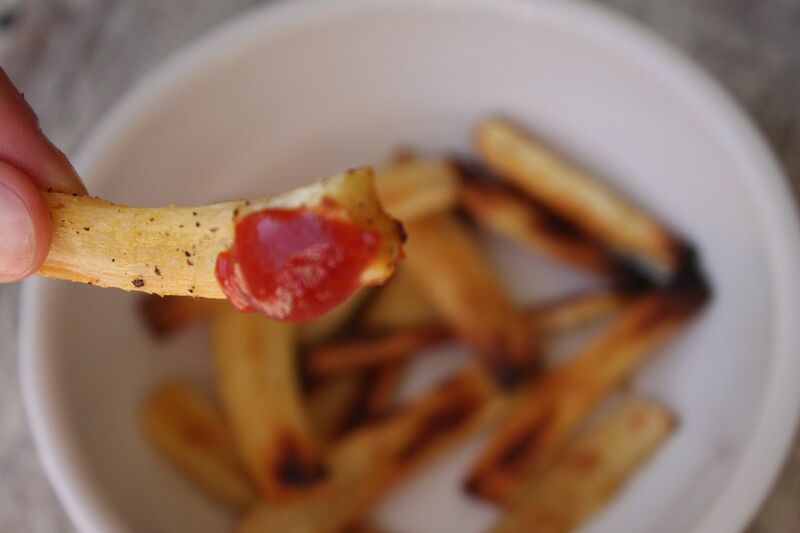 Cut them into french fry like slices. Try to make them all pretty similar in size so they bake evenly. Place all the ingredients into a bowl and toss parsnip slices into mixture making sure to coat them all evenly. Line a baking sheet with parchment paper (easy cleanup) and bake at 400 degrees for 3o minutes. Turn them once while baking. After 20 minutes check on them. A little crispy brown texture is what you are looking for. If they look done before the 30 minutes is up take them out. The sweet/slightly spicy taste of the parsnip really comes out when they are baked. If you like regular french fries I guarantee you will love these! I will be making a giant batch of these for Super Bowl per my husband's request. The reason the bowl looks half empty is because by the time I actually got around to snapping a picture I had already consumed half of them. So yummy! If you are a fan of parsnip fries you might also enjoy zucchini fries and cauliflower poppers. I recently discovered that I love pasnips (thank you, Whole Foods! ), so I will definitely have to try out this recipe! Will try these for sure! Looks yum! yumm...another easy and healthy recipe. Thank you, you always have wonderful recipes to share! LOVE all these healthy recipes! You do such a great job making them look really tasty! Thanks for sharing! Woa talk about making me rethink not eating french fries again. I think these deserve a go-round. Hubby would definitely approve. P.S. do you know anything about hair!? how to fix BAD hair??? can I email you my situation? I LOVE parsnips. Love, love. I made them a couple nights ago sorta like your skinny cauliflower. I cooked them in water with some apples and then pureed them with butter. The second night I mixed in some mashed taters. Good stuff maynard. My fave is in with roast or stew. Mmmmmm. I'll definitely try your "fries". I need to start trying some of these veggie healthy snacks you keep posting about! I'm obsessed with parsnips, one of my fave veggies! I've never thought to do fries, I will be now! My kids actually like them too. Shocking! Oooh yum Lindsay! Love this idea. P.S. my husband turned orange too from eating too many carrots. I'd find carrot butts scattered around my car for weeks. Haha. 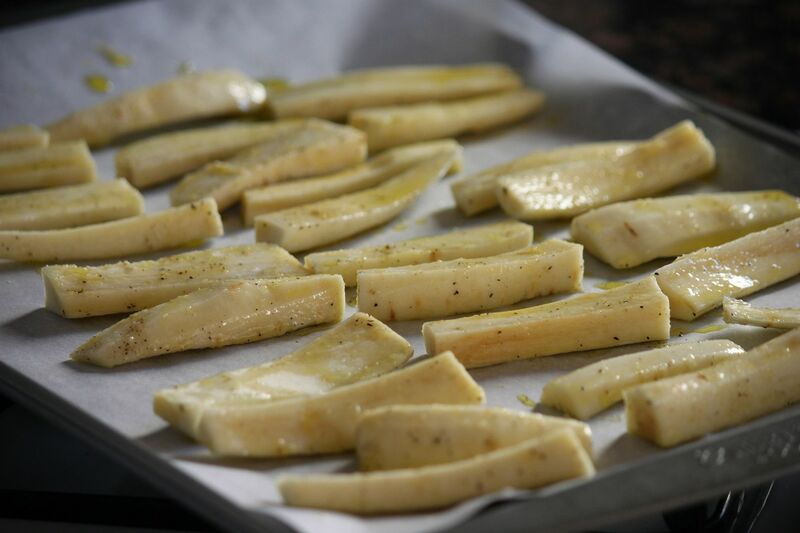 I can't say if I have ever had a parsnip but I am amazed that you can make fries from it & they look super good too! Pinning for future ideas for sure. Yet another recipe that I'm super interested in trying. They look yummy, that's for sure! wow!? I love sweet potato fries...I need to try these! i've never heard of a parsnip either, must try! No way! I would have never thought of that! Thank you!! I have never heard of this...but they look pretty tasty!! These look awesome! I am going to try them next week! Thanks for the comment on my blog! My husband loves fries, I think i'm going to have to give these a try & see what he thinks! Thanks! Hope you are doing well & feeling great! Absolutely brillant! I can't wait to try these! I lOVE all your recipes! I tried the cauliflower one recently, yum. Keep them coming! Lindsay, I am so glad when I find new AMAZING blogs like yours (thank the Internet for Pinterest)! I am dying to try practically everything you've posted. Thank you for sharing all of these great things with the world! Definitely want to try these out! I've always seen parsnips at our local Farmer's Market but never purchased them since I had no clue what to do (same with dandelion greens.......*scratches head*)but now I know ;-) I am anxious to see what my 1-year old thinks of them since he loves fries and this is a healthier alternative for him. I made these tonight for my extended family. Everyone loved them! Will certainly make again! These are So much better than "regular" french fries. It was hard not to eat the whole batch! I haven't read a blog in a while, so am a bit behind, but these look Ah-Mazing! I can't wait to try them! The cauliflower bits looks delish too! Hope they turn out better than my first failed attempt at kale chips! I actually went to the store after your first mention of parsnip fries but without a recipe, was afraid to try. I'm doing it this weekend! Wow!! I just started reading your blog. I made these for dinner tonight and LOVED them. Thank you! I love parsnip fries! They have a really interesting taste when you make them into mashed "potatoes." I have a client that is dying for parsnip recipes- I will send this one along right away. Thanks! I didn't like them. Oh well. You win some, you lose some. Delicious! I don't think they would be a particularly healthy substitute for potato fries though since parsnips are ridiculously high on the the glycemic index! This was a hit in my household! I am really enjoying your recipes! I'm able to sneak in some fun, savory, healthy snacks that are filling into my weakly meal rotation. I know this is an old post, but thank you thank you for posting this! This recipe has been a life saver and I've made it a dozen times since I discovered it a month ago!